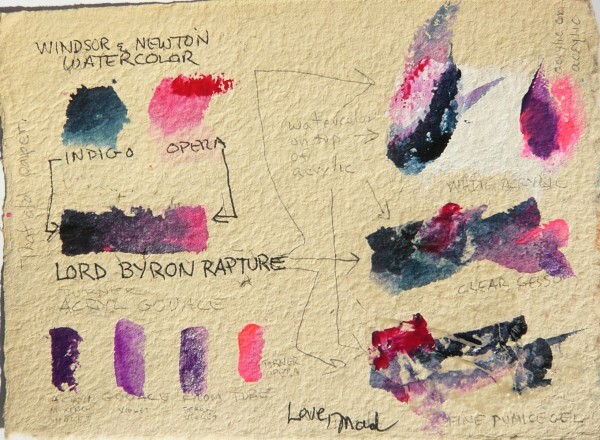 There is a mail art call on the theme of Lord Byron. It's a no brainer since that's what I'm doing anyway. ... quite a challenge to paint rapture though. Good thing I bought that purple. It is stormy and has glitter. And texture. Any rhythm. 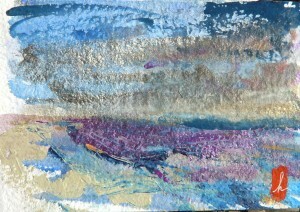 Using finger paint from tube, wash, palette knife scraping, reference to Marin (of course) and brooding gleaming clouds. 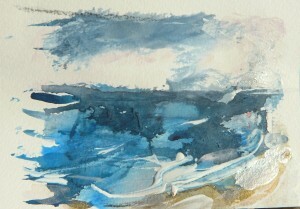 And there is nothing like Windsor and Newton watercolor indigo. I use it on top of acrylic then spray acyl fixative on top to turn it into acrylic without interrupting it's watercoloryness. Acrylic indigo does not have the same quality at all as the wc. Now I'm going to mix an alternate rapture with opera pink and indigo. That should be interesting. Here is a postcard of the rapture mixes I sent to Kay.